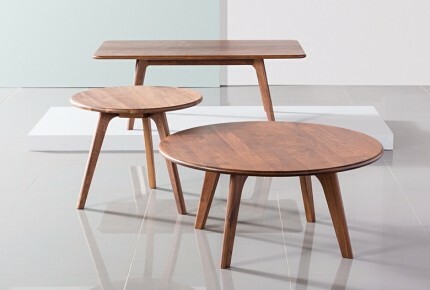 A room is defined by the furniture pieces we choose to adorn it with. And usually all of these elements have a purposeful nature, however in some cases they can also be used to set the tune in a room. For an area that normally includes only a small amount of furniture, like the dining room, one should be careful when picking out every piece of the puzzle. In that sense, besides the table and the chairs, the dining buffet also plays a large role in achieving the final look you desire and the functionality the room requires. Technically, the purpose of a buffet is to provide storage space for your dining essentials such as dishes, flatware and table cloths. But let’s be honest, more often than not we use this type of furniture to showcase our exquisite china collection and other decorative items we’re so proud of. In that aesthetic sense, the style and era of the buffet we pick is an important consideration point. The selection to choose from is incredibly vast, but usually the romantic, period styles lead the way. 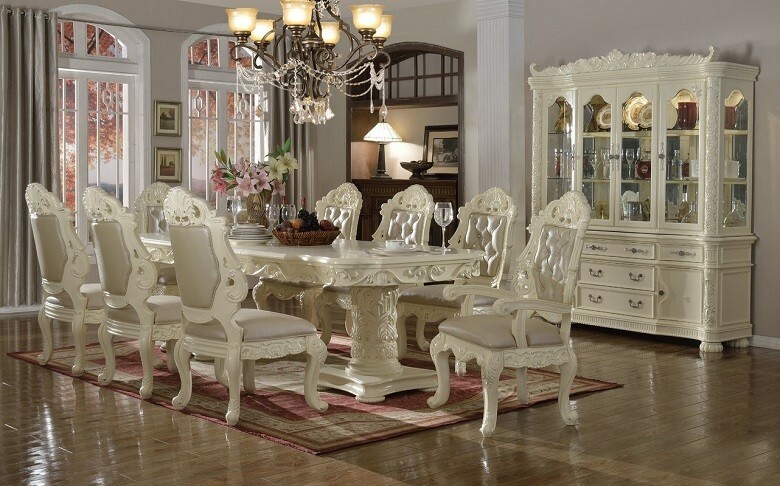 French provincial, in particular, is a popular look for a dining buffet. French provincial buffets are large and ornately carved pieces that immediately capture people’s attention. Usually coming in a delightful shade of white, these well designed pieces of refined wood can blend in charmingly in any setting and provide a rustic but airy feel. An important decision you’ll have to make concerning your buffet pick is to choose either closed or open storage. Many people in the quest to achieve a more formal atmosphere go for a closed storage. A closed storage buffet does not expose your dining items for everyone to see, so you don’t have to worry that they are arranged nicely. 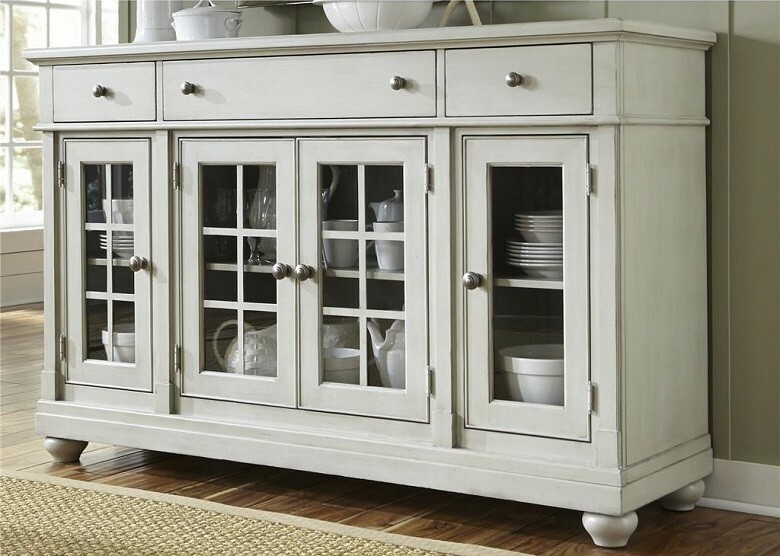 And this is all fine when smaller buffets are concerned, however a bulky piece that’s built as a closed storage can look more like a wardrobe than a buffet. An open shelving piece has a lighter feeling than the heavy closed storage and can adorn the space as a beautiful decorative accent. With a piece that has glass doors you get to have the best of both worlds – show off your beautiful china while protecting it at the same time from curious hands. Perhaps you haven’t yet consider it, but the size of the dining buffet also plays a role in the room’s arrangement. There’s an unwritten rule that the buffet should never come shorter than the dining table but should exceed its height by at least 40 cm. This makes everything that’s displayed in the buffet at a perfect eye’s range for everyone seated to see. A large buffet is noticeable and can be a beautiful focal point, however, be careful that you don’t compromise the freedom of movement. If you feel that’ you’re strapped for space, selecting a smaller sideboard might be a nice alternative option for a buffet. All in all, a dining room without a buffet will always feel like it’s lacking something. Not only does it provide storage space and helps transform the table from cluttered to clean in no time, the buffet can become just the stylish centrepiece the room needs.